Grenaboard is very light and strong non-combustible board made from expanded vermiculite and inorganic binders. This board is surfaced on both sides with paper and all four edges pressed for easy connection. 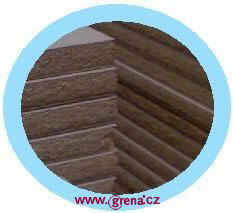 Grenaboard is certified to increase fire resistance of different types of ceiling structures up to 180 min. for one direction of CD profiles. - Spacing of CD profiles from 450 mm. with spacing from 450x450 mm. the type of ceiling construction.